Phoenix Skin & Body has been providing beauty treatments and skin care in Beaumaris since 2000. Meet Our March Clinic of the Month, Halo Hair & Body Beauty! Is Oleogel Plus Our Most Versatile Product? Meet Our Clinic of the Month, SANCTUM SKIN + HEALTH + BEAUTY! Skin Health Studio Is Our First Clinic Of The Month For 2019! At Everwell Medical Centre, our qualified doctors are dedicated to your total health and well being. We offer professional medical services, health advice and all the information you need to help you get well, be well, live well and ever well. Is Your Product Really Corneotherapeutic? Meet Palms Skin Studio, Our Clinic of the Month! There Are Only 11 Mondays Until Christmas! Meet Our Eco-Friendly Clinic of the Month, MySkinSpa! DermaClear Clinic is where your journey to optimum skin health begins. Simply Gawjus is owned and run by holistic beauty & skin therapist, Abbie. Abbie has been in the industry for 25 years and is an advanced lash & brow artist with a passion for skin care. Meet Our Clinic of the Month, New You Skin & Laser Boutique! GLOW Skin + Body provides a warm welcoming personal experience, for those who seek that inner and outer GLOW. All in the comfort of a leafy clinic, nested in Doveton, where we make sure your experience is personal, not numerical. Our Oleogel R Listed As A Fab Fresh Find ! The Facialist is Our Clinic of the Month for August 2018! Women’s Day is Australia’s number-one selling weekly magazine. From the latest celebrity news to food, beauty and showcasing the season’s must-buy fashion, Woman’s Day is a weekly burst of inspiration, education and escapism for all Australian women. ELLE is the coolest, smartest fashion brand for stylish, creative women who want to be the first to know everything. Meet the Clinic Among the Trees, Face & Body! Calm and Help heal post-treatment skin with our soothing D-Panthenol. What’s the Deal with DMS? Getting to Know Medical Aesthetic Laser Clinic! Meet Our May Clinic of the Month, Plume Holistic Skin Therapies! Introducing Our Brand Ambassador, Robyn McAlpine! Meet our April Clinic of the Month, The Beauty Elixir! ME Skin & Body Therapy creates bespoke skin treatments and has a passion for educating their clients to better care for their skin holistically. This skin-focused business is open by appointment only. Derma Aesthetics Awarded a Win & a Highly Commended at The MyFaceMyBody Brand Awards! All the Winners of Our Clinic Awards! Meet Medacare, our January Clinic of the Month! We’d Love Your Vote in the MyFaceMyBody Brand Awards! Our Clinic of the Month for December is SJM Skin Aesthetics! SJM Skin Aesthetics is located in the heart of Mornington on the Peninsula. The Peninsula is well known for its quality organic produce, wine and beaches! The demographic also invests in their health and often prefer a holistic approach which is what we attribute a vast amount of our success to. We pride ourselves in also taking a holistic approach to skin health. Skin Image is a beauty clinic specialising in skin rejuvenation. Using the latest technology such as skin electroporation, light therapy and collagen induction therapy, we focus on achieving results to give you healthy, beautiful skin. Our Clinic of the Month for November is Skintifix! Meet ELDERBERRY+KATE, Our Clinic of the Month! Our Christmas Duos are Here to Make Your Holiday Shopping a Breeze! Talking Beauty with Our Clinic of the Month, Talking Beauty! Get to Know La Bella Medispa, Our August 2017 Clinic of the Month! Meet Spoil Yourself Spa, Our July 2017 Clinic of the Month! The Beauty Lounge is Our Clinic of the Month for June 2017! Get to Know Sallyann Paramedical Aesthetician, Our May 2017 Clinic of the Month! DM Beauty is Our Clinic of the Month for January 2017! Elysium Face & Body Treatments is our Clinic of the Month for December 2016! Skinovations is our Clinic of the Month for November 2016! Lily Claims Gold at the WorldSkills Competition! Give the Gift of Great Skin This Festive Season! La Bella Advanced Skin & Laser are our Clinic of the Month for September 2016! Asthetique Skin Care is our Clinic of the Month for August 2016! Professional Beauty (the bible of the beauty industry) chat to Co-Managing Directors, Reika Roberts and Simone Vescio. deco mineral makeup is here! Click below to watch Makayla from House of Maxx talk about internal gut health and external skin health. House of Maxx is our Clinic of the Month for May 2016! Young Skin Logic is our Clinic of the Month for April 2016! Are We Your Favourite Wholesaler of the Year? Vote Now! ProfessionalBabe.com is a lifestyle site for the professional woman who wants to have it all. View the article live here. The Clear Skin Expert is our Clinic of the Month for February 2016! MINK Hair & Beauty is our Clinic of the Month for December 2015! CleanSkins Laser Clinic is our Clinic of the Month for November 2015! Beauty NZ is the magazine for the New Zealand Association of Registered Beauty Therapists. 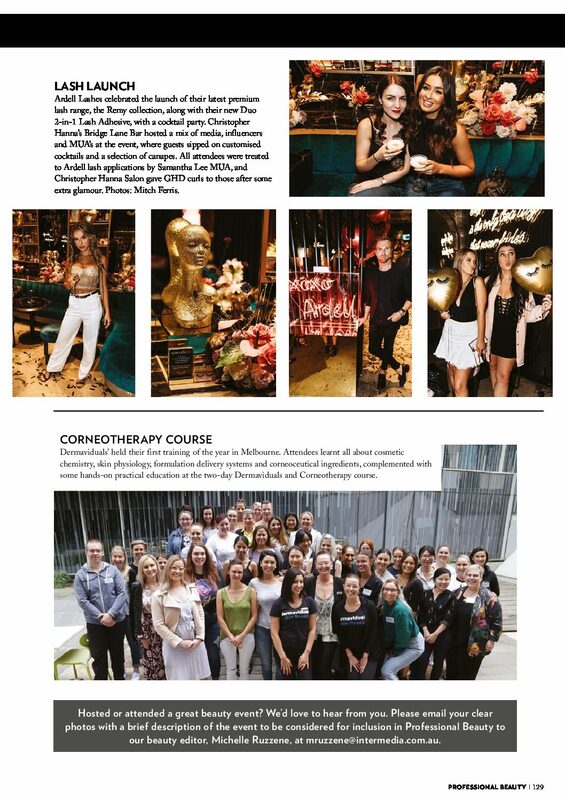 Professional Beauty is the leading business to business magazine for the Australian beauty industry. Beauty Biz is the essential business guide for salons & spas. Splash into Summer with dermaviduals! Laser Effect is our Clinic of the Month for October 2015!